FIFA announced the name of the players that were nominated for Ballon D’Or this year. Once again there will be a tough competition expected among the top footballers from the world. Its pretty difficult this year for the jury to decide about the top three nominees for the award. Because some players performance was outstanding last year such as Harry Kane who wins twice golden boot in Premier League. David de Gea superb goal keeping during premier league matches and Europa League matches giving him edge on base of his goal keeping skills. Ballon D’Or award is given to the player who shown great performance last year. Ronaldo and Messi are the two players who won continuously in last five years. 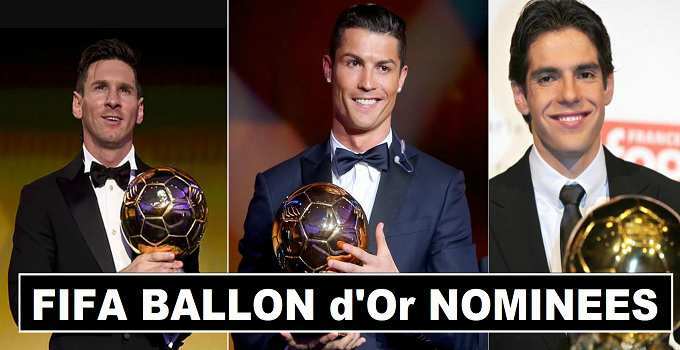 Earlier its called (Fifa player of the year award) but after year 2010 the name is merged to (Fifa Ballon d’Or). The other footballer who won the award are (George Best , Zinedine Zidane , Michael Owen and George Weah and Kaka). In the above table you will see the name of players that gets listed for (Ballon d’Or) award for the year 2017. There are two goal keepers that get nomination this year for the award (Gianluigi Buffon and David de Gea) well lets who will make it top 5 or third position just like last time German goal keeper (Manuel Neuer) gets third position in 2014. Most players of Real Madrid get selected this year for the award after them Barcelona and PSG players.